One of my readers was asking for a recipe of 密汁鸡 (Pronounciation in Mandarin as “Mi Zhi Ji”) in my FB Fanclub. Without her further elaboration on the dish title, I assumed she wanted the honeyed chicken. However, I had an urge of making the honey char siew flavour version instead, last weekend. So, I cooked this for this time, and I promised to cook the other honey chicken next time, ok (smile)? Well, it’s still worth cooking this recipe even if it’s not the desired recipe as it was so delicious! For the sake of the appetite of your kids, cook this, anyway. They will certainly love the sweet savoury taste! 1) Rinse chicken wings. Place them in a large bowl. Combine well with all seasoning ingredients. Dredge every wing with the seasoning mixture, and marinate for at least 2 hours. Or, do it the night before for overnight marinating (But reduce 1 tablespoon of oyster sauce for overnight marinating to avoid over-briny taste). 2) Preheat a large saucepan over medium fire, place wings into the hot frying pan, but do not over crowd the pan. Keep remaining sauce in the bowl for later. 3) Sauté wings for 10 minutes each side, or until all sides are caramelized (glazed) and well sautéed. Remove from pan and arrange on a serving dish. 4) Put remaining sauce into the pan, and bring to a boil. Pour the sauce over the roasted wings. Serve. However, sauté on frying pan might be difficult to achieve even roasting on whole joint wing, unless you don’t really mind its appearance. Or, use only the mid joint part. Otherwise, you may consider the oven baking method instead. 1) Preheat oven to 230°C. Line baking dish with aluminum foil, and place wings on it. 2) Place baking dish at the high rack of the preheated oven, and bake wings for 8 – 10 minutes. 3) Then, do a check on the doneness on its surface. You might need to turn the wings over to bake for another 5 minutes or until caramelized, in order to get even baking on both sides. 4) Remove from oven. Thinly slice when strips are cooled. Serve with the sauce. Note: For oven baking method – If you prefer more glazing on the surface of the wings, you may want to separate the addition of honey to the seasoning, and brush honey on one side of the wings only after abt 8 minutes bake. Bake for another 2 – 3 minutes, after brushing the honey. Flip over the wings and bake for 3 minutes before brushing honey on it and continue baking for another 2 minutes before heat off. This is also to avoid the wings from burning in case you do not have time to check on the baking constantly. Well, I could think if another good way to do this dish. The simplest and fun way..
Char it with direct charcoled fire during your barbeque party, simply roast it till browned and done. That’s just so simple and delicious that way! 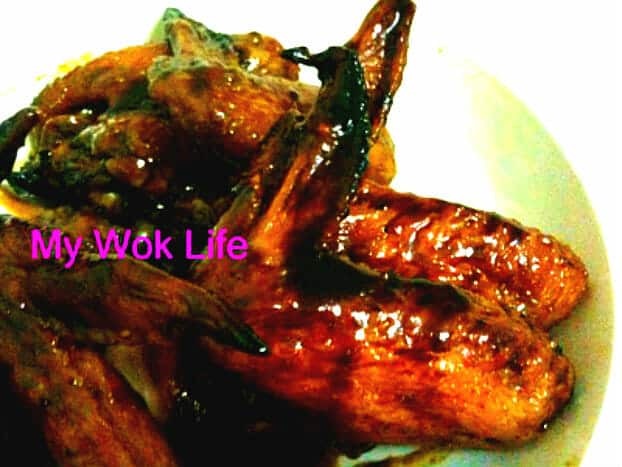 This honeyed Char Siew sauce chicken wing yields 220kcal. Tips: Get Zedoary (沙姜) from Traditional Chinese medical hall. Buy it either in grounded form or in small pieces, depends on availability. Both are good to be used. For this dish, instead of using chicken wing, can i use pork ribs? And if I use Oven to bake, can I don’t line the baking tray with alumunum foil…but just oiled the baking tray? Yes, you may use ribs. I think it will taste even better, if you like ribs. Hmm.. you can choose to go without lining but use the oil method instead, but do you not worried you might have hard time to wash the tray after baked. The caramelised sauce might stain on the tray stubbornly. And, if use ribs, you may also wish to increase the oven temperature to 250C instead. BTW, i intend to do 26 ribs. Does that mean that I double your portion for all the seasoning ingredients? That will be 4tbsp of honey, 10 tbsp of sugar….. will that be too sweet? Oh, I did not know abt the health hazzard thingy on aluminium foil. 26 = 1kg? If so, yes, double the amount. Hmm.. I will suggest reducing honey by half (meaning just remain the amount of 2 tablespoons as it is) first, then slowly add sugar by tablespoons till your desired sweetness. usually reduction of 1 – 2 tablespoons. Do taste check in between. Actually for using ribs, you may also check out my Char Siew recipe as they are more to the same catogory. Using aluminium foil in cooking is cancerous :p Like wrapping potato and barbeque it…its toxic…heehee….